Playful places build better bonds—among kids, neighbors, and communities—and those relationships are the foundation for communities that thrive. 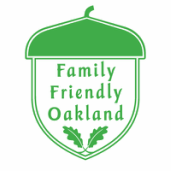 Family Friendly Oakland’s Play Oakland campaign encourages families to play along the way by providing a moment of delight as they wait for a bus or wait to cross the street. As a PlayEverywhere Challenge Winner, we are working with community artists and partners to building a more playful Oakland – one trash can at a time. Our Play Oakland Mosaic Trash Can Makeover Project was selected as one of 50 winning projects out of a pool of more than 1,000 applications nationwide. Since 2016 13 mundane trash cans at bus stops and busy intersections have been adopted through the City’s Adopt-A-Spot program, and community artists have tackled boredom and blight by transforming them into playful and engaging mosaics in North Oakland - Golden Gate, West Oakland and Chinatown. The artists worked with community leaders and volunteers to design and install the mosaics. By adding color, art and whimsy, the mosaics encourage conversation and inquiry for kids and adults. ​We hope this project will inspire a real transformation to make play and community action a way of life for all Oakland kids and families. We want to be known as a city that celebrates children and youth and inspires them to make our city better. Let's work together to make sure Oakland is a place where children "hop and skip through the day and moments of frustration are turned into moments of joy." Learn more about KaBoom's campaign to foster play everywhere and Family Friendly Oakland's #PlayOakland project to make our city more active and fun for every generation.